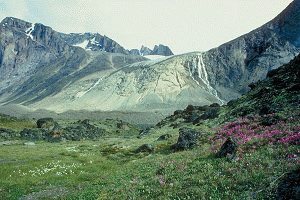 Travel In Nunavut has excellent and varied ways to help you capture business from the Internet. Share your Nunavut travel experiences. This region is as diverse as it is beautiful. Icebergs, glaciers, mountain ranges, and an abundance of wildlife including the very special narwhal whale, are all here in the Baffin Region. Book accommodations today and experience this northern wonderland. Pay a visit to the new capital city of Nunavut and see what northern city life is like! Canoe or kayak through nearby rivers and parks and see wildlife roaming freely, and feel refreshed as you breathe in the fresh northern air. European discovery was via the famous explorer Martin Frobisher and Iqaluit Bay (formerly Frobisher Bay) was once a major fishing and trading center and is still hopping with business and trade. The locals, however embracing they are of technology and development in their capital city, are still traditionalists and are always happy to show visitors their skills, crafts, and tell stories of their history. Book accommodations in Iqaluit and experience all that Nunavut has to offer - in a nutshell! Pang, as it is known for short, is a major whale-spotting destination, and the history of whaling in the region can be explored at various visitor centers. Nearby Auyuittuk National Park provides hiking expeditions unlike any other, and miles and miles of unexplored arctic territory! Explore the nearby bowhead whale sanctuary where the animals are protected and can be clearly observed in the waters. This is the Inuit Art Capital of the World! Come and enjoy local carvings and sketchings that are notoriously different from those of other Inuit communities. The local wildlife will surely inspire sketchings of your own, as you will see caribou, foxes, whales and walruses. Canoe among the icebergs, with the northern sun beating down on your face. See whales and other marine wildlife up-close as they feed in the warm polynyas in the water. This is the place to see northern wildlife in peaceful and stunning surroundings. The land of the Midnight Sun awaits you as you sail through isolated icebergs, glaciers and stunning mountain vistas: don't forget your camera! This is also Canada's most northerly community. This is the cultural hub of Nunavut, and is alive with festivals, archeological sites, and an oral history project in which elders' knowledge of tradition and history is being documented. This area comes alive in the summer months with colourful flowers and round-the-clock daylight! The place of waterfalls, as it is known, is a very fitting name for this community, since it is a water-lover's paradise. Whether you enjoy simply admiring the waves or waterfalls crashing in the water, or you actually desire being in on the excitement in a boat, this is your destination. Check out this hiker's paradise, where the trails will take you through the scenic arctic landscapes you've only read about!